UPDATE: Feb. 4 -- The individual responsible for the video purporting to be of a Bigfoot in New York's Prospect Park is, in fact, a local performance artist, Brian Whiteley. Whiteley, who initially identified himself to The Huffington Post and The Brooklyn Paper as "Russell Strark," admitted to HuffPost that he created -- and starred in -- the video as a way "to get into what the Bigfoot is." Whiteley explained that he wore the Bigfoot costume for the video as part of a larger artistic project that draws on the public perception of and social responses to the legendary creature. Whiteley mentioned that the project includes sculptures and other Bigfoot-related videos, which can be seen on his website. Previous projects have involved "magicians to entertain Bigfoot, so I could get a feel for how he acts" and a "dead Sasquatch" on a beach. Whiteley also claimed to have set up an OKCupid account as Bigfoot with the goal of eventually videotaping himself on a date in character. Whiteley emphasized that he had no intention of misleading anyone or riling up Bigfoot enthusiasts. "I'm invested into this world and not simply just some guy trying to stir the pot as an obvious hoax," Whiteley told HuffPost. He admitted, "I didn't expect it to come back to me and I don't want to get this notoriety for that, because it's not really what I'm after." The Blizzard of 2015 brought more than just record amounts of snow to places from New York to Massachusetts -- it also sort of, kind of, maybe became ideal strolling weather for none other than Bigfoot and its distant cousin, Yeti. While an obviously costumed individual walked the streets around Boston on Jan. 26 during the snowstorm -- dressed as the legendary white-haired Yeti -- its dark-haired relative -- aka Bigfoot -- was supposedly jaunting through storm-riddled Prospect Park in Brooklyn, New York. That's right: Bigfoot in the Big Apple! As seen in the above video, around 12 seconds in, a dark figure emerges from a hill on the left side of the screen, comes into the frame and seemingly looks around for something in the snow and then eventually walks off to the right side of the image. "We thought it would be a fun story to do," Noah Hurowitz, a Brooklyn Paper reporter, told The Huffington Post. "Because we didn't know that much about the guy, we presented the story in a half-skeptical, half-credulous way." But Hurowitz was skeptical about Strark's video. "First of all, there are plenty of wild animals in Prospect Park, and I think that if there was a Sasquatch, Bigfoot, Yeti or any other sort of wild man beast, he would've been seen by now. Second of all, it does just kind of look like a guy walking in the woods and then digging in the snow. We didn't report that Bigfoot was in Prospect Park -- we reported that a guy caught an interesting thing on film." Prospect Park is a nearly 600-acre public area situated in the middle of several neighborhoods in Brooklyn. It includes a zoo, nature conservancy, 60-acre lake, numerous sports facilities and a bandshell for outdoor concerts. The red circle in the map below shows the area where Strark says he shot his video. HuffPost caught up with Strark, a freelance videographer, to get his side of the story. He said that he sets up cameras around Brooklyn to take time-lapse videos that he offers for sale to television and other media organizations. He also told us he's done a great deal of video editing. And he wasn't too happy about how The Brooklyn Paper presented his story. "I don't think they particularly believe in Bigfoot. They were going after my character and I feel that happens to people in the Bigfoot community. "For the snowfall, I placed a couple of cameras around the park -- one by Grand Army Plaza, and the [Bigfoot] camera in question was in the woods to capture the snowfall. I wanted to get a few time-lapse pieces to debut my site, The Brooklyn Live Video Feed." Strark explained how, in order to record time-lapse video sequences over several hours, he uses a memory pack that's able to capture more memory, that requires 100 megabyte storage capacity. "I have a battery and enough memory and set it to record. If it runs out after 10 hours, that's fine with me," he said. "I set it up as the snow was falling and I went home and picked it up the next day. It had a 24-hour capture -- a slow memory card that captures it over time, and then I speed it up to make the time-lapse of the snow accumulating. So, I wasn't even nearby at all. The camera was inconspicuously hidden on a tree with a little covering on it. I just put a hood over it and strapped it to a tree and covered it as best I could from the elements. It was just one minute of time that Bigfoot appeared, so you couldn't see any movement of the camera." 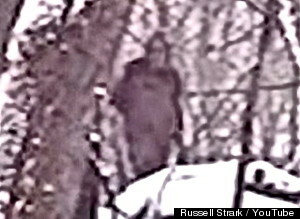 In this close-up and enhanced image of the figure in the park, an argument could be made for human facial features. Also, here and in the actual video, it does seem to suggest that he/she/it was wearing something with short sleeves. "Although I think this is a fun video, it's what we call in the entertainment industry, "highly produced," said Ben Hansen, a frequent Bigfoot researcher and former lead investigator of the Syfy Channel series, "Fact or Faked: Paranormal Files." "The videographer provides no explanation as to why there are record, battery and camera setting icons superimposed on the screen. If he was really setting up a live streaming web channel, why the additional frills? It's more likely he was trying to Hollywood-ize his video, much in the same way we see in 'found footage' films, like 'The 4th Kind,' 'Paranormal Activity,' 'Apollo 18,' etc. "By adding graphics, the director hopes to give the impression that the footage came straight from the camera without editing," Hansen said. "While he wants us to believe that we're looking at continuous raw footage, there are obvious edit points at the 1:07 and 1:13 minute marks where the video is looped to replay. If there's any doubt, look at the same bird that flies across the lower part of the screen at 1:11 and then again at 1:17. "Why would you stop the recording immediately after the supposed Bigfoot disappears behind the tree? More than suspicious, especially because the videographer allegedly wasn't even present to stop the video. Later, when he went home to edit the video, he realized it didn't seem believable to have the video stop right after the creature disappeared from view. Solution? Borrow some footage from another segment of the video and just loop it to give more filler time at the end." Brooklyn Paper writer Hurowitz has watched the video several times and is still skeptical about the whole thing. "It sets off all sorts of alarm bells for any journalist. Bigfoot in Prospect Park is patently absurd and we can't even prove that the video was taken in Prospect Park." But Strark maintains the truthfulness of his tale. "The park was closed, there weren't any people around, and that figure didn't look like it was just a guy wearing a coat -- it looked like a full body of hair to me. It looked like what I would've called a Bigfoot. "I'm more of a believer after all of this and I want to do more investigation over there at the park -- maybe set up more cameras and we'll see what people think. I don't want a big backlash on me and not really interested in having anymore attention drawn to me." Check out the following HuffPost Weird News BIGFOOT podcast we recently recorded!